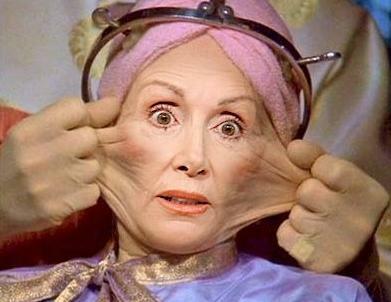 The air in the building is heavy with the lingering scent of fermenting corn mash. The pervasive, permeating presence of the aroma is much like a grandmother’s house that has a distinctive, comforting smell even when nothing is in the oven. I’m particularly excited about my visit today; I don’t know if Thomas and president Brian McKenzie (who has the same last name as Thomas, but is no relation) will agree, but for me their announcement this week is one of the most exciting since I first heard the rumors of the opening last July: They finally have a date for their bourbon release. Finger Lakes Distilling renders me giddy. It’s not just the excellent liquor, made with local berries, corn and grapes. It’s the idea of a distillery in my own neighborhood. Though they are legally producing liquor, the thought of a still near the edge of the Hector National Forest feels thrilling and naughty, like smoking in the girls’ bathroom or, I imagine, growing marijuana hidden between tomato plants in your garden. Though Finger Lakes Distilling is a classy venture, with architecture and tasting room décor inspired by the distilleries of Scotland, I can’t stop myself from calling their product “hooch.” Their business is the first of its kind in the Finger Lakes region to focus solely on liquor. Recently relaxed restrictions on farm distilleries, which allow farms to have tasting rooms, combined with the rising popularity of craft spirits have led to a growing trend in New York State: this summer, three more distilleries are slated to open in Brooklyn alone. As the story goes, Thomas and Brian met three years ago at a distilling conference in Louisville, Kentucky. Thomas comes from a long line of distillers, but he’s the first to legally take on the task. His thick Alabama accent conjures up visions of a dilapidated backyard shed that houses a ramshackle still. You can almost taste Thomas’ family heritage in all of the liquors here, brought to life by Brian’s entrepreneurial energy. Initially, the distillery released vodka and gin, both made from local grapes, and both of which won Best in Class at the 2009 New York Spirits Awards. 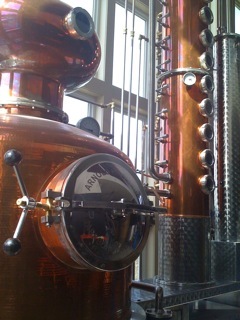 The gin, which boasts complex anise and citrus notes, has been a big hit with the public. 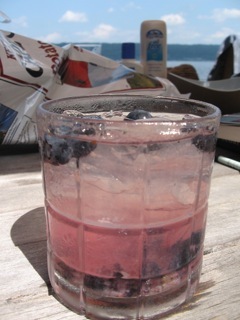 The wild berry vodka is a perfect addition to a glass of lemonade. They produced sweet liqueurs next (I recommend cassis and raspberry), followed by rye and then grappa. Most recently, the distillery released an exquisite cherry liqueur that tastes like the juice of fresh-picked sour cherries. In my house, we went through three bottles in two weeks (for educational purposes, honest), and I’ll be taking another half case home with me today. Thomas explains that in the last fifteen or twenty years, liquor has typically been distilled and aged at higher proofs than it was previously, which allowed producers to fit more in a barrel, in turn reducing storage costs. Instead of aging their bourbon at 115 or 120 proof, Finger Lakes Distilling chose to age it at 100 proof. Brian believes the way the spirit interacts with the wooden barrels is affected by the lower proof, thus resulting in a different flavor. Thomas disappears for a minute and comes back with a tiny bottle. “Try this,” he says, pouring me a splash of the brown liquor. It tastes amazing, different than any whiskey I’ve had before, though I lack the words to describe how. “Wild Turkey,” he says. “Distilled in 1971, bottled in 1978.” I wouldn’t turn twenty-one for another thirteen years. Finger Lakes Distilling bourbon is made with 70% corn, 20% rye and 10% malted barley. The corn is not a hybrid, nor is it genetically modified. It is local, open-pollinated corn, and organic, too, which Brian says results in a superior fermentation. Less than 300 bottles will be available, and they suspect it will sell out quickly. “It’s the flavor of the land,” says Thomas. I agree. 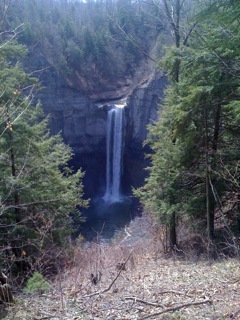 Tastes like the Finger Lakes to me. The tasting room at Finger Lakes Distilling is open daily from 11 a.m. to 5 p.m. More information can be found at www.fingerlakesdistilling.com. 1974 was a great year for cocktails. “IS HISTORY IMPORTANT?” My preoccupation with this philosophical question started when a crazy ex-boyfriend hunted me down so we could “reconnect.” After I successfully avoided him for seven years, he cornered me in the periodical section of the public library, and yes, he actually cried. He argued in non-library tones that we should revisit our time together; our relationship the most beautiful year of his life, he said. Clearly, I thought, history is a construct, viewed through the biases of the reminiscer. I politely declined his reconnection request. I’m not convinced that history is important, and my ex is a strong justification for never looking back. When I’m playing Trivial Pursuit, you won’t find a yellow pie wedge in my game piece. Geek though I am, history was my worst subject in school. In fifth grade, I failed my first test ever in world history. I bombed the American history AP exam in high school. I seem to be incapable of memorizing dates and historical events (though I remember in vivid detail Romeo’s naked buttocks in the 1968 film Romeo and Juliet, which we watched during tenth grade lit class). My history angst stretches into the arena of cocktails. For the love of Dale*, I can never remember where classic drinks came from, who made them, and why. The elitist worship of old-school cocktails drives me crazy with its snobbery of “shoulds” and “shouldn’ts” that many bartenders try to impose on today’s drinks. I’m not interested in either shaking raw eggs into cocktails or glorifying the disgusting herbal liqueurs sold during Prohibition in pharmacies as “medicine.” Some cocktails are best forgotten, like my ex-boyfriend. But family heritage is my notable exception. Be it stories or objects, I saved everything my parents ever gave me, like the pair of red knee socks with white hearts my mom bought for me twenty-five years ago. Though they’ve faded and the elastic is long-gone, causing them to bunch around my ankles and slide into my shoes, I still wear them every February 14th. 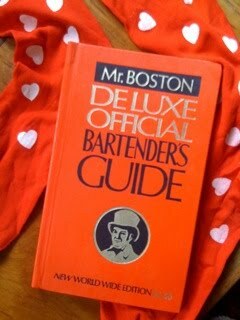 When Leah and I opened the Lounge, my parents passed on to us their 1974 Mr. Boston Bartenders Guide (53rd printing). I flipped through the classics, but what caught my eye were the handwritten recipes penciled inside the back cover. Tequila sunrise. Daiquiri. In my dad’s script, Margaritas: Fill a blender halfway with tequila and the rest of the way with half triple sec and half either limeade or pop. And then there was my mother’s favorite drink, recorded in her slanty handwriting: Apricot Sour. Reading the recipe, I could taste it in memory, its tart flavor known to me from eating the liquor-soaked maraschino cherry left at the bottom of her glass. Fill a Collins glass with ice. Add brandy and juices. Stir. Garnish with maraschino cherry. *Dale DeGroff, a master mixologist credited for the revival of classic cocktails.